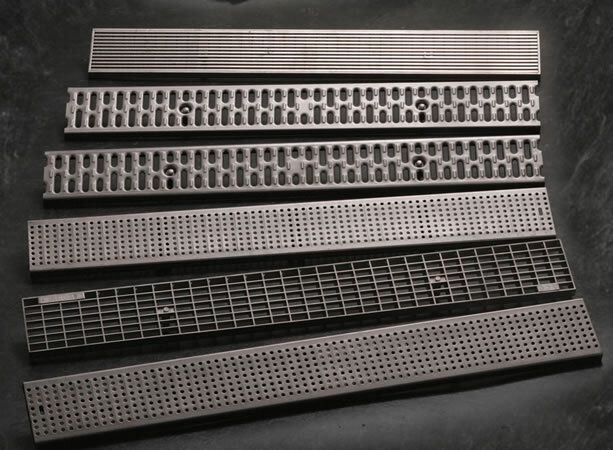 9660 - Modular Stainless Steel Trench Drain System - Jay R. Smith MFG Co. The 9660 Modular Stainless Steel Trench Drain Series is constructed from 16 gauge, type 304 stainless steel for facilities where hygiene, corrosion resistance, and visibility are imperative. 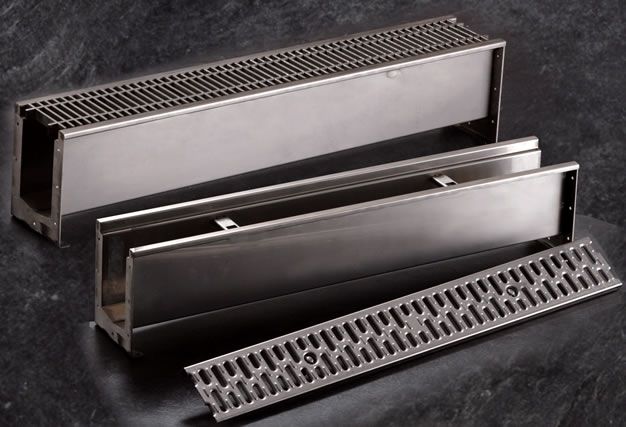 Stainless steel trench drain channels shall be 39.38” long, 6.38” wide, and have a 4” wide throat with bolting end plates. 23 modular channel sections shall be made of 16 gauge type 304 stainless steel. Channels shall be provided either neutral (flat) or with a .6% pre-slope. Channels shall be available with inverts ranging from 3.75” to 7.50”. Regularly furnished with secured light duty 9870-450-SS slotted stainless steel grate and 4” no-hub vertical outlet on channel sections 2, 5, 10 and 15. End outlet plates are available in 2”, 3”, and 4” no-hub, see table for channel selection. Trench drain shall be Jay R. Smith Mfg. Co.® figure number 9660 series. Fabricated 16 Gauge type 304 stainless steel trench drain system with pre-sloped modular trench drain body sections (depth as specified #1 shallowest #15 deepest) with bolting end plates, 4” no hub bottom outlet at low end, supplied with secured stainless steel 9870-450-SS slotted grate.